Medicare Advantage Enrollment Periods: When can you enroll? 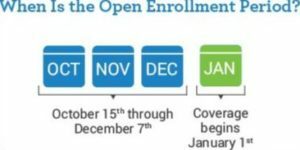 Medicare Advantage Enrollment Periods: When can I enroll – 2019? UPDATED Mar. 6, 2019. You may join, switch or drop Medicare Advantage Plans only during Medicare Advantage Enrollment Periods. People who either have Medicare and Medicaid or qualify for Extra Help are an exception from this rule because they can switch plans every month. Medicare Advantage enrollment is on a calendar year basis, starting the date your coverage begins. Medicare Advantage Enrollment Periods – Liberty Medicare Video. You may find the script for this video in Initial Coverage Election Period (ICEP), Initial Enrollment Period (IEP) and other Medicare Enrollment Periods. Initial Enrollment Period (IEP) is a 7-month period that begins 3 months before you turn 65 or 3 months before your 25th month of disability. It is used to enroll in Medicare Part C and Medicare Part D and includes the 3 months before, the month of, and the 3 months after the triggering event, such as turning age 65.
if you have delayed Part B enrollment, then ICEP lasts 3 months and ends the last day of the month before you are enrolled in both Parts A and B. In other words, ICEP ends just before your Part B begins. This is obviously very confusing – please contact us for clarification. If your plan becomes effective, you may not make another ICEP election even if ICEP has not expired. Medicare Open Enrollment Period runs between October 15 and December 7. Your coverage will begin on January 1 of the following year. You may switch between Medicare Advantage plans. You also may change from the Medicare Advantage plan to Original Medicare, or from Original Medicare to Medicare Advantage plan. You also may change the Prescription Drug Plan (PDP), enroll into it (if you didn’t have it) or disenroll from it. Notice, if you are in the Medicare Advantage plan with Prescription Drug Coverage (MAPD) and you decide to join the stand-alone Medicare Prescription Drug Plan (PDP), you’ll be disenrolled from your MAPD plan and return to Original Medicare. You may make more than one election during the AEP. Your final election during that period is the one that counts. Medicare Advantage Open Enrollment Period (OEP) runs between January 1 and March 31. It allows people enrolled in an MA or MAPD plan to make a one-time election to go to another Medicare Advantage plan, or to leave their Medicare Advantage plan, return to Original Medicare with an option to join a stand-alone Medicare Part D plan. It does not allow for changes in stand-alone PDPs. You are enrolling in the 5 stars plan, etc. If you are looking for Medicare Advantage coverage, Liberty Medicare is here to assist you. We’ll help in all stages of comparing, selecting and enrolling in the best and most suitable Medicare Advantage Plan for you. Our services are offered at no cost to you.